Aeroseal Windows & Storefront provides professional commercial windows and doors installation in Bowie, MD. We have been a family-owned and operated company since 1999 and have over 100 years of combined construction experience. Our extensive experience is what gives us the edge over our competitors. When we work on a job, we make sure it is done right the first time. No job is too big or too small for us. Aeroseal has over 15 years of experience installing commercial windows, and we install high quality, energy efficient windows in every project. Many property managers don’t realize that, on average, 30% of a building’s energy is lost through its windows. We help to minimize that loss with weatherproofing sealants and other miscellaneous installation methods. We will talk over your goals for the project and explain the process. We will take a look at the jobsite and take measurements and finalize any last-minute changes. At this time, we will also provide a detailed estimate. We will order the windows from the manufacturer and do the installation. You will find our installation team is very professional and fully aware of the scope of the project. If you have any concerns you can always voice them to the project manager (PM) who is in charge of your job. We also have a vast array of experience installing commercial doors and storefronts. The installation process is very similar to the window installation process. Our goal is to make it easy for you to install new doors or replace the old doors effectively and efficiently. Many of our clients have thanked us for the minimal disruption to their everyday environment in the workplace or apartment complex. We understand that the doors have to be done as quickly as possible, but still keep the quality and energy efficiency up to par. 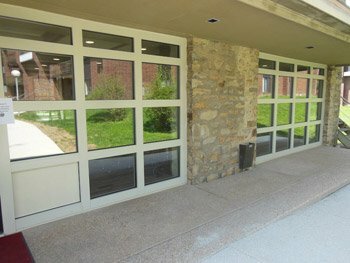 Every commercial window and door project can be customized to match your building and organization’s character. Let us help you find the perfect exterior solution for your building! Also serving: Baltimore, Frederick, Gaithersburg, Hagerstown, Annapolis, College Park, Salisbury, Allegany County, Anne Arundel County, Baltimore County, Calvert County, Caroline County, and all of Maryland.